Great teachers don't always have the best lessons. But they always have the best relationships with kids. When a lesson does not go as planned, great teachers are not looking around the room... they are looking in the mirror. Great teachers always come to class ready to teach... but they are mindful of the fact that not all students come to class ready to learn. Great teachers don't show up for WORK... they show up for KIDS! It's a passion -- not a job. Great teachers understand the "Golden Rule" for educators: Teach every child the way you would want your own child to be taught. Great teachers are not intent on winning "battles" with the students. They understand that if there is a battle in the classroom, nobody wins. Great teachers define their success by the success of their students. They understand it's not about the teaching... it's about the learning. Great teachers are not defined by their lesson plans... they are defined by their passion. Great teachers are in it for the kids. It's not about the lesson plan, the rules, or the massive paycheck. It's always about the kids. Great teachers will spend some time this summer thinking about how they can improve their lessons next year. That's just what they do. Kids leave their class feeling better about themselves... because great teachers understand there is more to teaching than delivering instruction. Great teachers are never victims of "slacker kids." They refuse to let those students get away without doing the work. Great teachers are not driven by courses of study... they are driven by the faces in front of them. Great teachers can look past the bad attitude. They realize there's always something else going on. Great teachers did not become great by accident. They became great because they made a decision that being "good" was not enough. Thank you! You summed it up quite well. Most of these won't be found on any teacher assessment rubric. Thank you for recognizing the qualities I've admired and tried to develop for the last 25 years. It's great to see things haven't changed wherever you teach in the world. It's still the same ethos every teacher starts with each day, "today I will try and do better for the children than I did yesterday" and as we all know we don't always succeed BUT the important thing is WE TRY! fantastic comments. these qualities have been 'forgotten' by the people who make decisions about education. Inspirational! The reason why He kia Pirates ideas would not work in New Zealand.This provides the reason to keep going despite the behavioural problems of our day. Thank you for being "real" with what is most important in the classroom. The respect that you show your teachers is evident and your expectations for the process are so realistic. This was important for me to read as we get ready to start a new school year. This is everything I believe about being a great teacher. Fabulous article, thanks for sharing! My hat's off to all the teachers, especially those teaching in the elementary level. We have great leaders because of teachers - great and small. Really true.I never liked to be a teacher at first but the Lord did guide me to this profession and I've learned to love it.I am blessed, I was able yo meet a lot of different personalities and I could honestly say I have loved them as they are and did hope that something good is learned frim me not only about the subject but about life itself.Now that I am a retiree, I miss teaching as well as interacting with students. I can really relate, because I believe, I have this kind of attitude in my teaching..thank you for this message.. Thank you ! Great comments for reflection. Mainly great teachers never disconnect during non school time. Thanks for reading... and for the kind words. Having worked under the leadership of many outstanding educational leaders, I think the book could be called, "What Great Principals Know". Bravo! Agreeed with every single point. Someone once termed these as 'beyond compliance.' This article has made my day, thank you so much! THIS! "When a lesson does not go as planned, great teachers are not looking around the room... they are looking in the mirror." So powerful and I love it! Could be a "great" title for a book. :) "What Makes a Teacher Great? They Keep Looking in the Mirror." When you're ready to write, let me know. I was an editor before I was a teacher and I love your style! I am not longer teaching sadly and I miss it. That one resonates with me, too. Self-reflection. Well put. Lisa, funny you say this cause I play the man in the mirror by Michael Jackson on my way to work almost daily to make sure I have my head in the right place. My students asked me why I have a mirror in the back of the room. I want to see what they see. If I bore myself then change is due. Awesome! I too think of MJ's Man in the mirror and apply it to my daily goal for improvement. I look to "Make that Change" and Make a Difference! You hit the nail on the head! Great article! Thank you for the affirmation! I think this is true for all grades, but especially early elementary. That's interesting: I thought it was especially true for my high school! Meaningful and right on target! Thank you for focusing on the heart of teaching and teaching students. Thank you for affirming what is really important. That's the kind of staff I want! 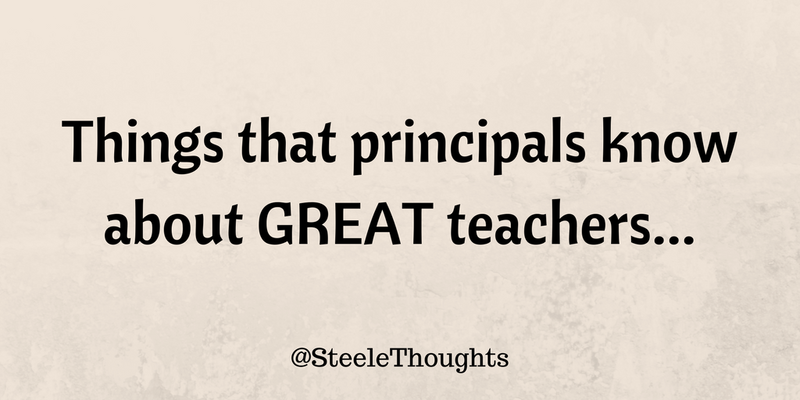 Thanks for realizing that you have to remember what it's like to be a teacher in order to be a great principal. Thank you for recognising that the time and effort spent on setting and implementing assessment, the at-home time it takes to enter data, create this plan or that, takes the most important time away from teachers, the actual time to connect and teach lessons that are engaging for each student. Over the years, I have discovered that the most amazing and impacting lessons are those which the children have steered off the "planned curriculum." Assessment and data has it's place of course, but when it seems to be the highest priority, rather than the kiddies themselves, the system has got it wrong. Thanks for acknowledging what teachers do do, and yes it is about the kids and how they learn whether it is easy or hard for the teacher! Nice sentiments but a bit pie in the sky when faced with the deadlines, assessments, expectations, etc. with which classroom teachers especially at the secondary level are faced. Nothing pie in the sky about it. I am one of you. I am not a great teacher, but I keep aspiring. Not pie in the sky. Great teachers don't let administrivia squelch their passion - they do it, use it to their advantage and STILL keep kids as their focus. Asolutely! We must think of the administrivia as part of the "job"...the connection with the kids is the "passion"; the great part. Relentless...Passionate....deadline, assessments, expectations, etc. wilt in the face of that relentless passion and are just a footnote to great teaching. Students always win with this type of teacher. This is real. Just need quotation marks around the word "massive". Thank you for acknowledging great teachers! More principals should read this article! A good title: "Defining a Great Teacher" or "The Difference Between a Good Teacher and a Great Teacher." It is always about developing and maintaining strong relationships! With ALL students. A very good reflection of great one or to be the one by owning these.Thank you! Great words..... We are "the great teachers"
Great article!! Very true and I plan to share this with my administrators! Some of your reasons have helped me to realize the difference between the great and not so great teachers around me. I appreciate the time and effort you put into this list and hope many can take this information and be inspired to be better than they already are! Great teachers always know that they are not just teaching a lesson, but are teaching students! As an Educational Support Professional in an urban setting, I totally agree with you. I have worked with many teachers in my 28 years, and the teachers that were the BEST did everything you described here. All educators don't expect praise, but love it when they hear it. Thank you for being a great principal! Thank you for writing this brilliant article. You have definitely captured the very foundation of the definition of what is at the core of ' every great teacher,' while simultaneously explaining what a 'great' Principal should be looking for. Brilliant ! Thank you . Every principal, school superintendent, and school board member should be required to read this article especially in our data-driven world. Many forget that it is about the kids and the teachers that teach them; we have just become numbers on a spreadsheet. Wendy, I was thinking exactly that comment. All it takes is one bully administrator to ruin a great teacher's passion. Great teachers understand that learning is not enjoyable for everyone, particularly for those who have critical parents. Learning is an act of courage in the risk that one takes to be wrong, belittled and not supported. A great teacher conveys to a student that she can hold hope when the student cannot see hope. Beautiful article! Thank you so much for writing this. In 1990 I was the Texas Elementary Teacher of the Year, not because I had the best test scores or even because I WAS the best teacher in Texas, but because I was THIS teacher and for one year I represented every good teacher in Texas. I needed this today because just this week I was informed (after 15+ years serving on this committee) I would not be needed on the committee that selected our regions Elementary Teacher of the Year because "it was decided to have people on the committee who were closer in age to the 5 nominees!" Yes, I understand but it made me feel useless. I am 75 years old, but I still know great teaching and I can recognize teachers who have a "heart for their students." Carry on, young 'uns! Thank you for writing this. As a teacher who just finished her 31st year in the classroom I wish all new teachers could read this. So many give up too soon because they don't have someone encouraging them to strive to be a great, kid-centered teacher. In this high stakes testing, data driven environment we all need to help these young teachers become great teachers by helping them look in the mirror, not to see what they did wrong, but to see how good they are and how great they will be. Love these observations and each one is so true. I might add great teachers never give up - when their students struggle to learn, to interact with peers or with emotional turmoil they make it their mission to find a way to help that student overcome and learn, make and keep friends and find inner peace. 100% spot on. This is a great read for student teachers as they are trying to define what their practice will look like. Thank you for this.. I really needed it today.. Thanks a million.. Such great reminders of why we we do what we do, thank you. It is great to read that my life's passion isn't a simple data point; that someone understands it is about lives and not numbers on a chart. My heart is filled with Joy & flooded with tears right now. Thank you so much for your testament of experiences. I was given a very low demeaning evaluation this year because my lessons & class did not look like the others teaching the same lesson. I said, you must differentiate to meet all needs no matter how or what it takes to understand. Your words today, reaffirmed my teaching philosophy. Wow! You mean, (read with a bit of sarcasm), great teaching isn't about the scores?!! Thank you. Thank you for not making about the dog and pony show. Thank you for these enduring observations. I have found these ideas to be true...even if not simultaneously. I have said to every student teacher I mentored during my career that building relationships with your students is the first priority. Thanks for the list. Brilliant!! If only all schools had you as principal. I enjoy reading the part and enjoy it. When I started teaching my mentors always pointed out that it is about the student understanding than we are different coming from different homes. I still remember my first teacher I feld special because she took the time to listen and praise me even if I could not get the answer correct. Today I am a principal and try to encourage teacher to teach with compassion. One teacher nearly derailed my future when telling me that people living in our area never become professional's we are domed to work as slaves. Thank you again for a good book. You have validated good teachers everywhere! My advice has always been, "Teach kids first, content can be a distant second." Loved my 41 year career! Thank you! I work in Special Education and have been asked to speak in an LRBI seminary this summer. May I quote you? Thanks for your kind words about teachers. You are really a great principal to realize that about teachers. I want to add more ( a great teacher is the one who know how to inspire her students through each lesson each day). Tks again for your interesting article, which is useful for all teachers around the world to look back on the past n work for their passion. A great read and so true. Thank you. Teachers never feel like they do enough. I would like my staff to always consider what they have achieved, not focus on what they haven't. So well written! It isn't just "work" or a "job"... a great teacher is great because the reason he/she steps through the classroom door every day is because of the children, not the paycheck or any glory. Some of the best teachers I have worked with were quite eccentric, and didn't fit moulds. But the kids loved them because those teachers were there to let every child actualise their unique potential - and those children did themselves often not fit prescribed moulds. Every single line here is an unforgettable quotation! Wow! I remember getting a student I had prayed I wouldn't get. I decided I had to change the way I approached this child...not try to change him. And little by little, as I remained positive and caring (not always easy), he changed. I sent a letter home praising his efforts the 1st quarter and his parents said it was the 1st positive note he ever had. And we remained friends after Middle School! Teachers do make a difference. This is exactly why I got out of teaching. I was an excellent lesson planner and really enjoyed putting together experiences for my class, but I really struggled with connecting with the kids. It was too much for my introverted self and I couldn't give the kids what they needed. Much happier now! Being a so called great teacher is a journey, an ongoing process. It's filled with learning and reflection. It's filled with trying to figure out how to make better connections and how to build better relationships. I'm always trying to make classes mire challenging to bring out the very best in my students, so they truly hit that special level. I think about teaching almost all the time. I love to help my kids. That is why I teach. Thanks for validating that approach! I shared this on the website I administer, Teachers Standing For Solutions. It has taken off running! Seen by 14,000+, it is a great time for educators to read your amazing, accurate insight. Thank you for recognizing and reminding like-minded folks what it's all about. I am stealing your Steele thoughts. Okay not really stealing but putting a link on my own website to this article as I think your thoughts are spot-on!! Thanks for validating what so many of us believe---in such an eloquent way! Thank you so much Mr. Steele. I just retired at eh end of this school year and one thing that my principal said to me was just what you stated. I've always said to her that I know I'm not a great teacher but I keep trying. She told me that I am a great teacher because I am able to reach those children and parents who seem to be unreachable. That was one of the greatest compliments of my career that I have heard from administrators. So thank you sir for sharing that for those that may never hear those words. Well said! These words captured the essence of why teachers teach and who teachers are. Thanks for recognizing what great teachers are most passionate about---their students. Each one possessing great potential and possibilities. Great work this year teachers! Your impacting lives everyday! This is perfect! Any teacher would want to work for you! After six years as a literacy coach at one of California's lowest-performing middle schools, I chose to return to the classroom for my last three years before retirement, ignored my seniority and took the most difficult lime of classes. A very experienced assistant principal dropped in for an entire period during a very ordinary lesson with my intervention reading students one day and later said, "You are among the top one percent of all teachers I've ever observed." "Why?" I asked, considering the lesson so ordinary. He could not articulate his reasons. Thank you for perhaps putting into words what he meant, as this was me, I believe, during my nearly forty year career as an educator. Kids were my passion. Thank you, thank you, thank you. Finally, we are understood. Your words and thoughts really reflect who we are. To Teach is to PREACH. The more we learn the more we earn in terms of honour, recognition and pride. Cheers. Wow! Thank you for putting great teachers feelings into words. Sometimes all that a great teacher needs is to hear words like these to give them the motivation to keep going. A great teacher also has a never give up attitude. Thanks again for this! My administrator in Pennsylvania forwarded your thoughts on "Great Teachers" to all of us in the high school. Thank you for reminding us how vital "Great Teachers" are. Thank you. The joy of just being able to make a difference in someone's life - just as my own teachers had done for me - is worth waking up for each day! This is so inspiring! I saw this on Facebook and decided to read this, and I am so glad I did. I am going to be a senior in the Early Childhood/Elementary Education major in the fall and student teach in the spring. These are great goals to keep in mind! Thanks Mr Steele for taking time to ponder & pen this down. I wish all the principals all over the world think the same way as you, valuing those qualities of the teacher not easily detected on hard-copy black and white proofs which would usually entail having the number of events organized or the number of students who get all the As to be recorded as "proof of performance". Instead, your write-up focused more on valuing the sustained joy, peace and smiles that accumulated on the faces of the students, which could only be seen over a certain span of time. You have helped being the mouthpiece of many teachers, passionate for their cause in educating the young, rather than just taking teaching as another job to sustain their "rice bowl". Thanks for your effort in affirming the work of so many invisible "educating warriors" towards the holistic growth of students all over the world. Thank you for reminding us of these. teachers learn to better themselves not just because of the kids that they have in mind, but also because of the principals who trust in them. It's the trust of their school leaders that they gain courage to do what they do, knowing that we (school principals) have their backs empowers them. What an inspiring notes. Thanks for the share. This is why I became a teacher. I was disheartened about until this year when my AP told me how important my relationships with my students were and how she really appreciated the culture and climate of my classroom. She changed everything for me. I can never thank her enough for that. The best article i had read so far about a teacher.Thanks for a beautiful summary!!!!superb. This is so good to read. To see that you are connected as a principle. Many at senior management forget what it was like. It's not their fault either. They have different priorities different stresses. Thank you for never forgetting. I'm copying this and putting it above my desk at school. If I have a day I'm unhappy with I'll re-read this and adjust as needed. Teaching is a lifestyle and a mindset. I'm 61 and still hitting it full time. I think I've improved my craft each and every year I've taught. Just when I might have been starting to wane in interest I became the legal guardian of a 5 year old boy. It helps me tremendously to channel my feelings for Kai when I'm dealing with a difficult student and treat them as I would want Kai to be treated. Thank you for this early summer chance for self-reflection! Ditto, ditto, ditto!! Thank God for "Great Teachers"! - Some along the way have helped shape my very own life, which compelled the desire in me to "pay it forward". I enjoy every bit of building rapports with my pupils each year. It certainly contributes to an EXTREMELY rewarding school year. Thank you for your "SteeleThoughts". It yields for a delightful moment of reflection. Awesome. You have summed it up. It is about the relationships with the kids, reflection of what we do and of course the passion to see the kids achieve in their own way because they all are good. It is about unlocking the inherent potential in every kid. Teaching starts and ends in the heart. So profound thank you for the read. Its for the connections together with the young people, reflective with whatever we conduct of course a eagerness to check out your offspring realize for their private manner for the reason that all of them are fine. Its pertaining to unlocking a inherent possibilities in every single children. It's always to the friendships along with the small children, reflection about that which we implement indeed all the interest in to work out your children enjoy with their personally own solution as all of them are wonderful. It's always approximately unlocking all the untouched capability in just about every boy. Behind that baby face is a very mature sense of perception. The mama in me is so proud of you (and proud for your Mama as well :) ). Thank you so much. It is a great recharge for the teaching battery to be appreciated by someone that hasn't drank the latest educational kool aid. Love this list! My favorite: "Great teachers define their success by the success of their students. They understand it's not about the teaching... it's about the learning." It made me realize that whether I'm teaching kids or adults, when it's been a particularly good session/lesson, I never walk away thinking, "Wow, I was awesome!" I always walk away thinking, "Wow, that went really well! The students/participants really connected with what we were doing." Thank you! 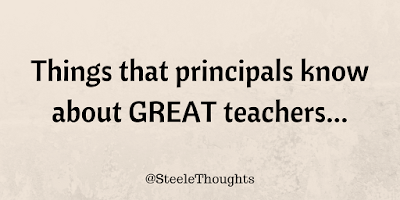 All of those things can also be said of Great Principals...I know you are one of those! Your teachers are so blessed to be so appreciated!!! This is awesome and powerful! Thanks! Thank you so much. I have been retired for 15 years but substitute all I can because I love teaching. I love the kids and I love helping the teachers who have to be out for some reason. You put into words what I have always felt as a teacher. Thanks for share! I agree. Congratulations! Great piece. Right on point! Thanks! Awesome.so true. Enjoyed reading it. I wish all bosses could think the same way. I needed to read your words this morning. It's an affirmation of what I believe, how I engage with students, and what I endeavour to foster in staff I coach. Yes. It is important to honour the commitment of great teachers. Thank you. Thank you so much. I am printing this so I can have it with me in my classroom. The focus these days is so much on the wrong things. It is easy to become frustrated and feel defeated. When I feel that way, I want to have this handy to help me remember why I teach and what is important. You are right. Thank you for the inspiration post! This is perfect for my own self reflection and reassured me I am doing what I do for all the right reasons! Thank you for these words. I dont mean to say i am a great teacher but i fulfil all those points. I m inspired bu these words..
Nice one, you really boast teachers confidence. ...real essence of a teacher. Thanks a lot for this amazing post. It leaves a good feeling to be reminded that I am on track. Thanks very much. I don't feel so bad after all. So true! Children come first so we can help them to become decent adults! Thanks for putting this out there! There are so many GREAT teachers that go unrecognized as being assets to our educational system, unfortunately. I've been teaching for 15 years and have the passion of a first year teacher EVERY year. I used to dream of getting teacher of the year, but gave that up when I realized that it was a popularity contest and that I wouldn't be working for the students to do what it took to win that award. I, instead, look to my students and the achievents we make (personally and academically) to assure myself that I am good at what I do. It IS a passion and I'm so fortunate to love my job and love the role I have shaping the hearts and minds of kids everyday. A great way to start a week!!! Because if you can pull it off, you'll be the envy of your family and friends. Because if you can pull how to make money online it off, you'll be the envy of your family and friends. I just retired from 40 yrs of living a passion; teaching and Principal(ing). :) :) You have succinctly articulated the attributes of a great teacher (and school administrator, I might add), Danny Steele. Loving to do, what one does, sprinkled with compassion and understanding, is the key to success in any profession, but even more so in educating. I am constantly working towards being a great teacher. The quote that I aspire to live by is "Love First, Act Second". I have it on my wall in my classroom and when the kids ask what it means we have a discussion. Teaching is the hardest job I have ever loved. Thank you for your words of inspiration and encouragement. Being a religious educator is an interesting career option and it is the best choice for someone who wants to pursue a career in this field. Teaching in the subject can be handled in an in-education discount and various religious beliefs can be explored such as birth life and death, in detail, with information provided on general beliefs and practices that need to be followed.